Combine milk and oats in a bowl and let stand for at least five minutes. Add oil and eggs, mixing well. Stir in flour, sugar, baking powder and salt. Stir just until dry ingredients are moistened. Cook on a hot, lightly greased griddle. 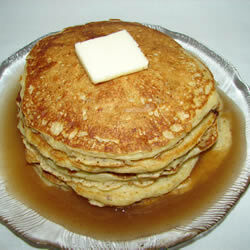 Turn pancakes when top is bubbly and edges slightly dry. Serve with butter or butter substitute and warm syrup.